New KK Court Complex fully operational Sept | Daily Express Online, Sabah, Malaysia. 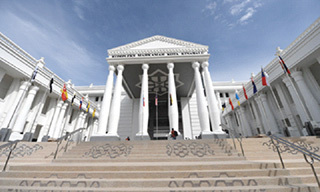 Kota Kinabalu: The new Kota Kinabalu Court Complex which cost about RM147 million will be fully operational next month, said Minister in the Prime Minister's Department Datuk Liew Vui Keong.He said currently the judiciary department and staff are moving into the new building located at Bukit Punai, off Jalan Kolam, here. "Many things from the old court building need to be shifted here, which I think will be done by the end of this month. "I am happy to see a new majestic and iconic building in the city. This is a defining moment not only for the judiciary in the State but also the people in Sabah," he said during a press conference after the handing over the complex from the Federal Government to the State judiciary, Thursday. Liew said there was a few months of delay in the project but the most important was that the developer managed to complete it and also saved about RM1.4 million from the RM177 allocation from the Federal Government. Asked what would happen to the old court building, he said he was told that it would be turned into some other functional court. "Maybe it will be used as a City Court, Night Court or other relevant court. "The old building could also be used to hear remand order applications during the weekends," said Liew. So far, the Federal Court, High Courts and a Sessions Court have already started their proceedings in the new complex and the remaining Sessions and Magistrate's Courts would do so by the end of this month. Liew said the new complex has three ethnic elements, namely Kadazandusun, Bajau Laut and Murut, in its design that also incorporated motifs of the national flower, Bunga Raya, and Sabah's official flower, Rafflesia. It has six Magistrate's Courts, six Sessions Courts including the Child Sexual Offence Court, three High Courts and a Federal Court. The construction started in April 2014 and the building was fully completed in 45 months. Liew also commended Chief Justice of Malaysia Tan Sri Richard Malanjum and Chief Justice of Sabah and Sarawak Datuk David Wong Dak Wah for their commitment in ensuring the project was carried out properly. Malaysian Public Works Department (PWD) Director-General Dato' Sri Ir. Dr Roslan Md Taha said the Industrialised Building System (IBS) was used in the construction of the building for up to 78 per cent, which exceeded the 70 per cent target set by the Government.